I love Cape Hedge Beach for its small size, its layers of sand and popples (smooth rocks), granite “bookends”, houses, view of Milk Island, and a peak of the Twin Lights on Thacher Island. It’s especially nice to have it at the end of the street. On some days the lifeguard will show up, but often the chair is empty and the warning sign is out. Some of my pieces focus on the figures, others more so on the landscape; in both cases though it's about the simplification of shapes and their colors and the interpretation of light and feeling. As I paint I do think about those that have inspired me, like Hopper, Avery, Diebenkorn, and Kent, for example. Note each of these artists are very much about shape and color as well as the figure. 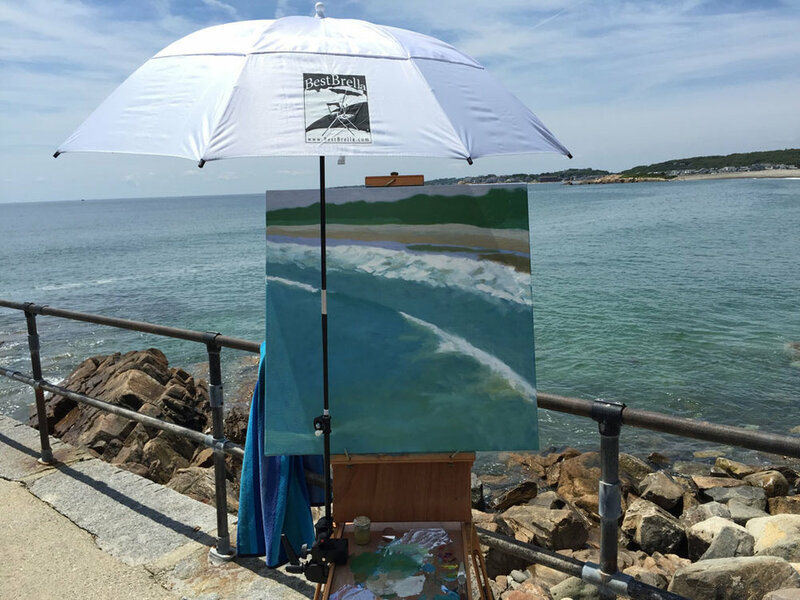 "Summer Circle" is a large piece that began on my plein air easel overlooking Long Beach. This can be tricky with a 3’ wide canvas when windy, but it was a relatively calm day. I spent a few hours up there looking down on the beach and water as the sun and tide moved along. Now and then I’ll have people stop by for a look at my progress - the kids are great as they are pretty open with their comments and big smiles. With the initial image on canvas I returned to the studio for continuing work. In this case I added more figures and worked hard on rendering the water and its changing colors at various depths and reflections of the sky. 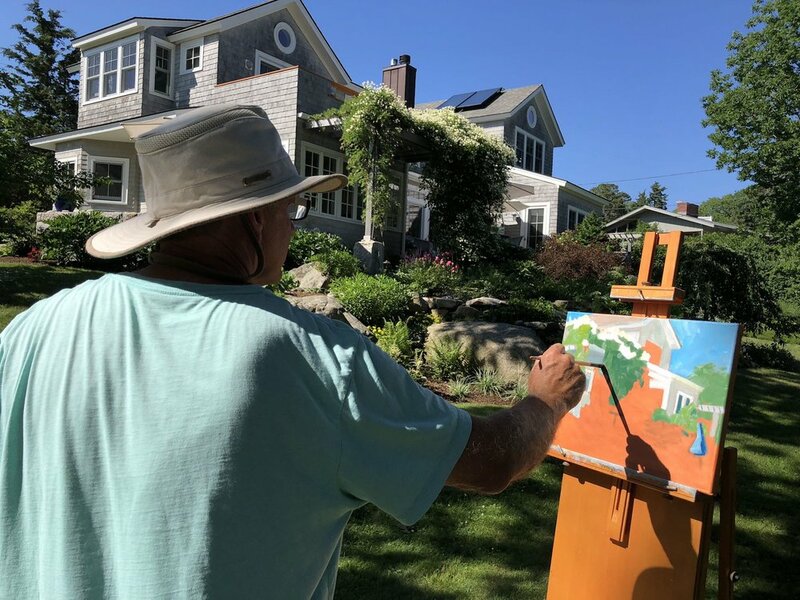 This summer began with the Rockport Garden Tour, in which we were one of nine Rockport gardens open to the hundreds of curious gardeners from around the region and beyond. We also had a group of plein air painters, including myself, finding inspiration in the flora. It was fun change of mindset to come home from the beach and take on the completely different subject of the garden with all of its complexities of flowers and architecture. Like the first Sand Dance, I was watching the kids fall into dance as they left the land behind and touched the water. On this early spring afternoon the air is clear and the colors are bright. The tide is ebbing, leaving room for quiet chaos under the fog's blanket. This is a pretty big one at 40 x 64; I like sitting in front of it and falling in. Off season there are often many more dogs than humans on the beach. A hot day is a good day for red and a hot date. Top it off with your orange bucket. Warm air pours over the cool, spring ocean at low tide, creating fog banks rising like dreams under a sleepy hat. This is one in a series of atmospheric pieces. On Bonita Beach in January the Sanderlings run at your feet while the Pelicans glide overhead and the people go every which way, but usually north and south. No, we're not on Cape Ann anymore... This is a big one at 40" x 54", and took a good month or so to make. I keep tweeking things while it settles - this isn't the 'final' image anymore. This is a small color study done plein air, standing high up on the Cape Hedge popple dune (rock pile) looking down on the incoming surf. I'm intrigued by the life and color transitions of a wave. The many influences on the color include the wave height, water depth and clarity (bubbles, sand), ground type (sand, rock, seaweed), water surface angle reflecting light from the sky and sun. Of course, water is clear with a reflective surface, so it's creating color from what's below it, in it, and above it. This is the frustration and fun of painting water. BTW, did you know that the color "blue" was never mentioned in texts like Homer's The Odyssey and The Iliad? The long row of cottages at Long Beach, Rockport, sit on sand held up by a tall, concrete wall. How long will it last? At high tide Cape Hedge Beach is pretty much under water. At low tide it widens to reveal a different landscape to rediscover every day. This is a large, complex piece developed over July and August. It's a hazy, summer day, standing on the popple dune at Cape Hedge, everything picking up a little gold from the afternoon sun. A breezy, hot day is good for a ride on the boogie board. Rockport's Thacher Island, home of many a wreck, keeps a view over Long Beach where visitors find solace. A late spring day, the water has warmed up into the low 50's, and despite a little fog the sun is warming the sand. The new foliage of the blueberry and poison ivy on Cape Hedge's rocky point is red with patches of green and a little shiny, brushed by the passing fog. 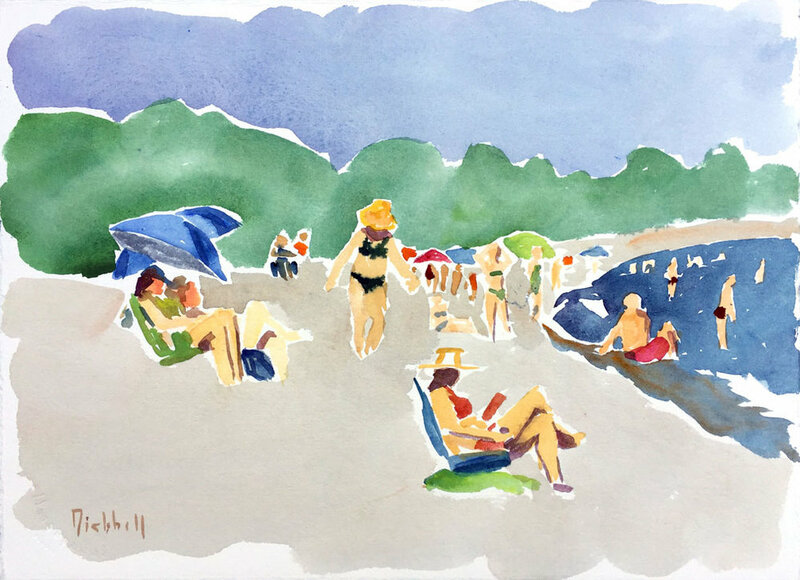 When the East Breeze picks up around 1:00 off the Atlantic its cooling relief can be welcome on a hot day at Good Harbor Beach. On a cool day though it can be bone-chilling, but dogs don't seem to notice the difference. Every summer morning at Good Harbor Beach the lifeguards arrive by 9:00 and warm up with their beach run. It's also a signal to the surfers to pull out until after 5:00. The fishermen can continue to hang out though. 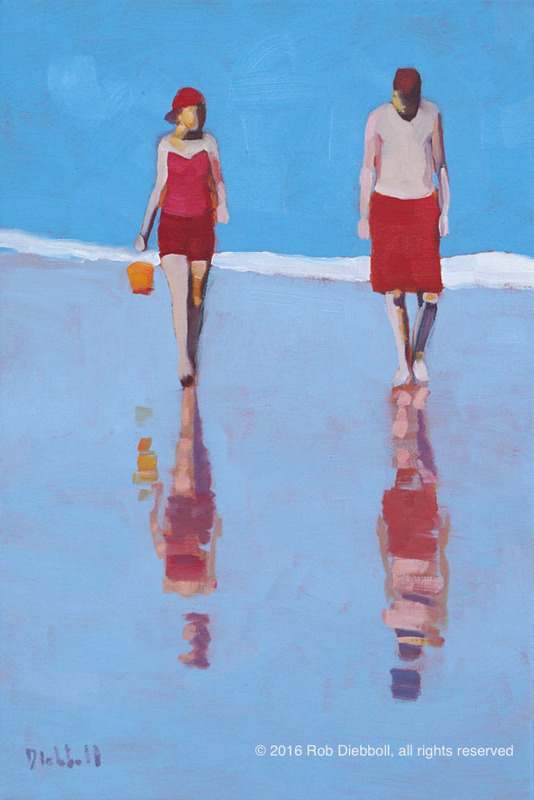 Lifeguards has been accepted to the annual seARTS at Bass Rocks show, Gloucester. 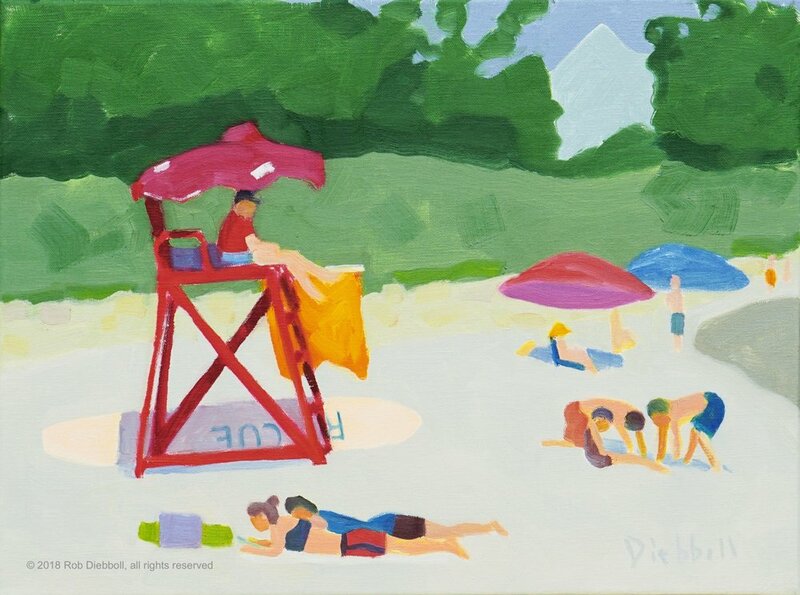 It'll be an appropriate location, looking out over Good Harbor Beach, the purview of these lifeguards. January sun on the sand does little to warm the daring youths on Good Harbor Beach. Nevertheless, they take their time enjoying their burning skin and lungs heated by fast hearts. You can see the initial sketch on my facebook page.